My granddaughter loves Barbie and certain areas of the grocery store too. (The cereal, yogurt, and fruits being her favorites.) So I was excited to spend the weekend playing a "working" supermarket with her. Sadly, this Barbie set disappointed us both. First, the positive aspects. 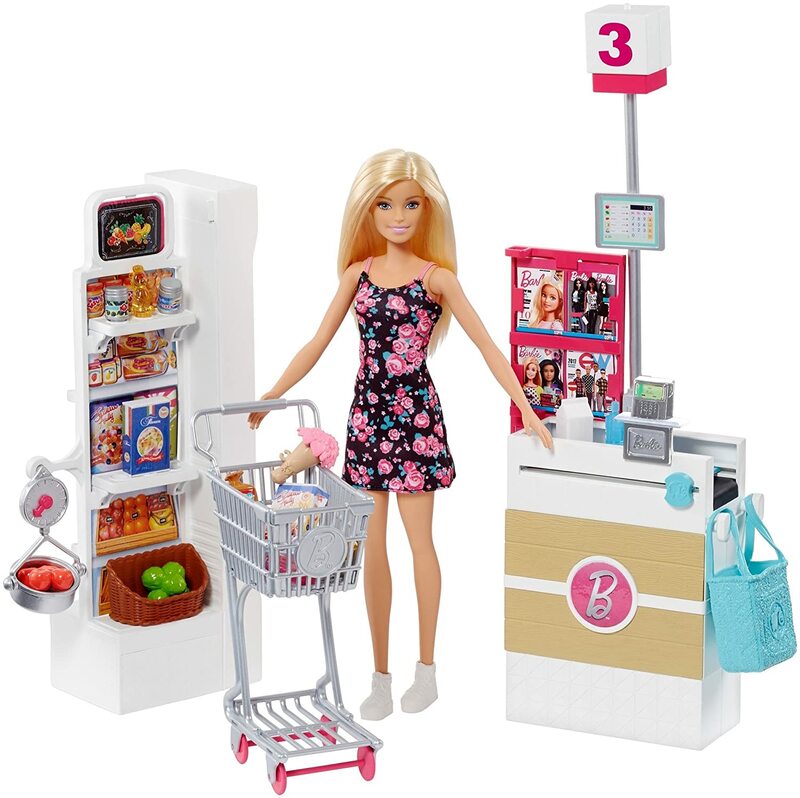 The set comes with a basic, blonde Barbie, nicely dressed, sporting sneakers for a trip to the market. There's 3 shelves with sections for the included items. 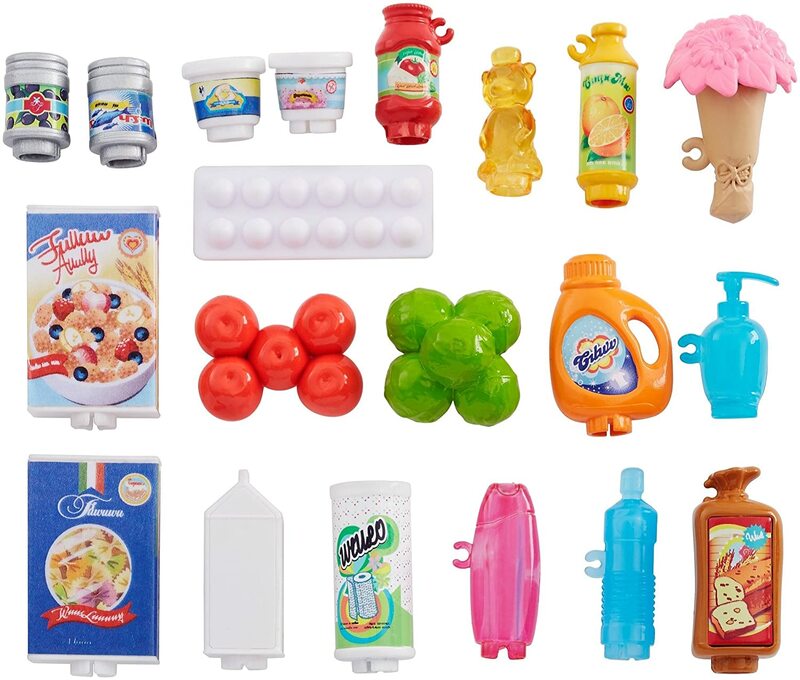 (20 various items are included) The background is decorated with product pictures, so shelves do not appear empty when an actual shopping piece is removed. Kids have a produce scale, MANUAL conveyor belt, a shopping cart that rolls, and a shopping bag to round out the supermarket adventure. After only a few minutes of play, my six-year-old granddaughter made several important observations. Most of the toys she and her sister really enjoy and continue to play with long after received, have some kind of bells and whistles. I am all-for creative play. Things that encourage children to use their imagination. But there needs to be something to make them want to return again and again to play with the same toy. This set has NO life-like dings as items are scanned, no noises from the register, no blinking lights, even the aisle number isn't illuminated. I thought it had a working conveyor that would automatically move items. It does NOT. Remember the plastic 'bar' we used to place between your items and the next customer's things? That's what you have here - a tiny, plastic, "scooter" kids must use to push items down to be bagged. Now it comes with only one bag and a shopping cart of items will not fit inside one bag. So you can either bag stuff, take it out, and bag the rest, or simply leave your order on the belt and dump it back in the cart unbagged. The lightweight plastic, free-standing design stands approximately 15" and topples over easily, which can be frustrating. Kids must stock and shop gently to avoid repeatedly knocking everything down. While I applaud Barbie for offering a toy based on a realistic experience, this one falls short. Just a few little improvements and the Supermarket could be a big hit with kids and parents alike. As is, I would not purchase this set and cannot in good conscience recommend it to other shoppers.